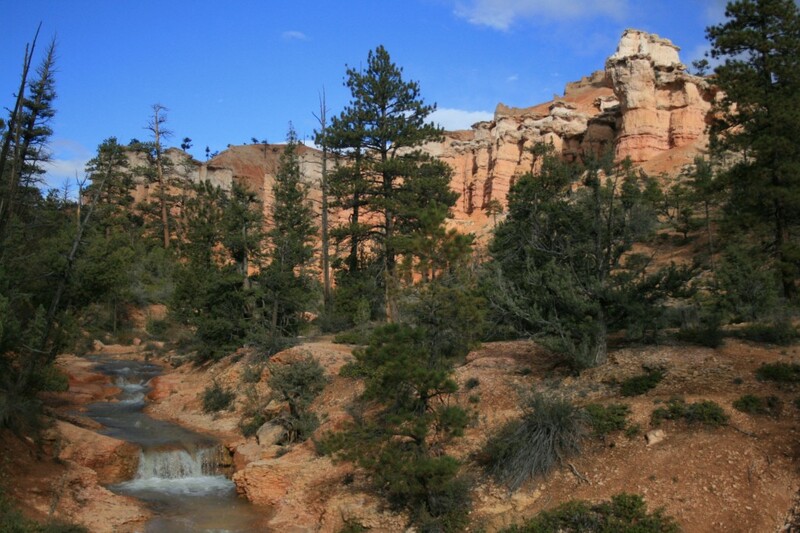 From Bryce Canyon, we headed east on the All American Highway 12, stopping by Mossy Cave on the way out of the park. 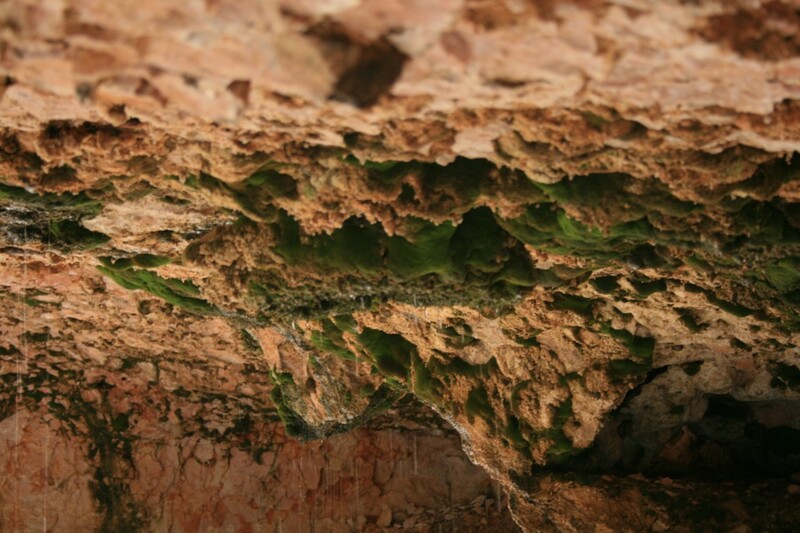 Mossy Cave, located in the northern section of Bryce Canyon, is totally worth the stop! 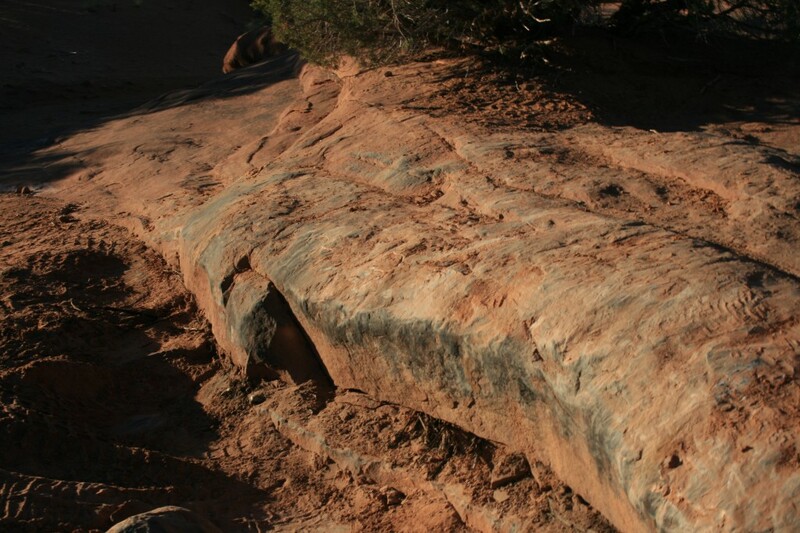 To find the trail leading to Mossy Cave, drive past Bryce toward Tropic and there is a pullout on the right. 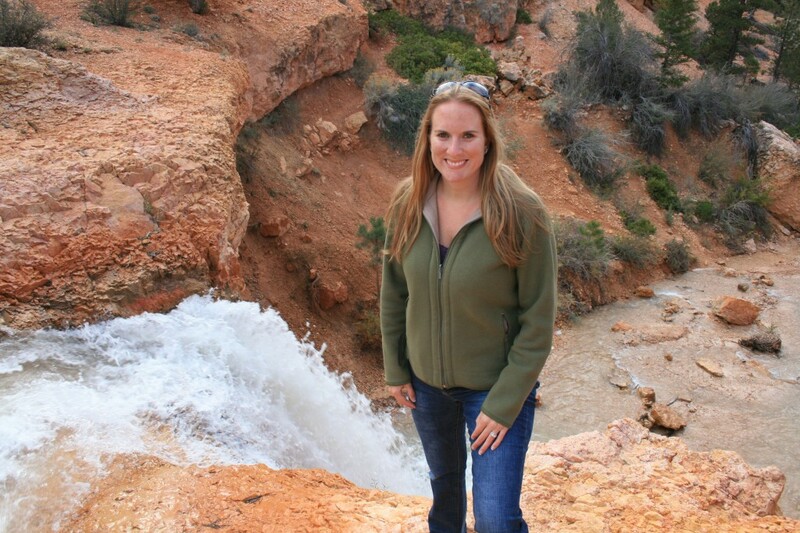 I highly recommend the one-mile roundtrip hike to the cave and waterfalls. 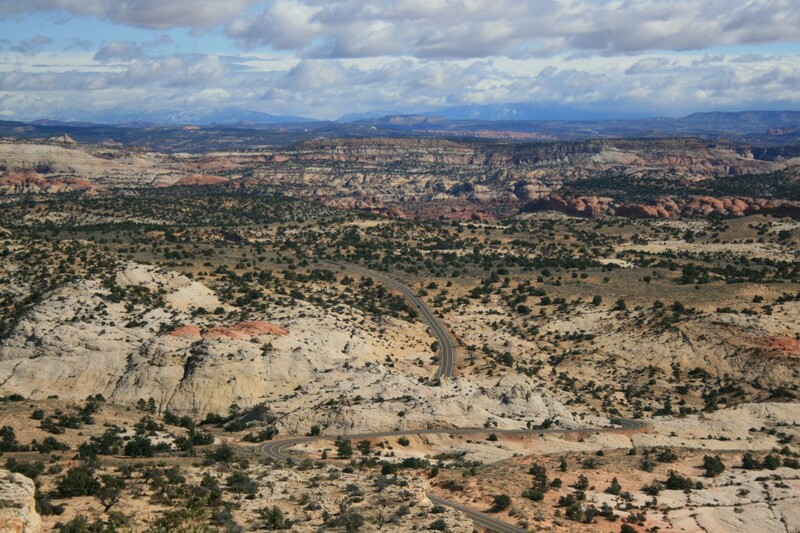 We continued on Highway 12 for about 40 miles until we reached Grand Staircase-Escalante National Monument. 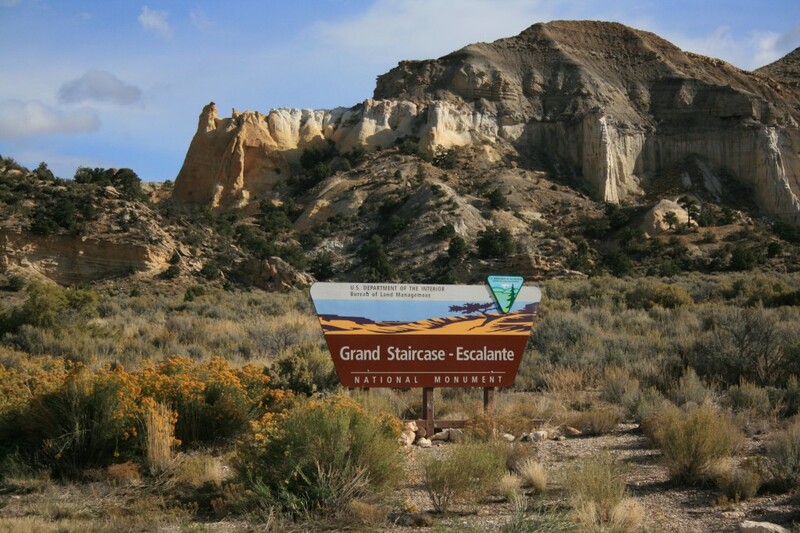 There isn’t a set entrance point for Grand Staircase, per se, just a landscape of unique geographic formations unlike anything we had seen before! 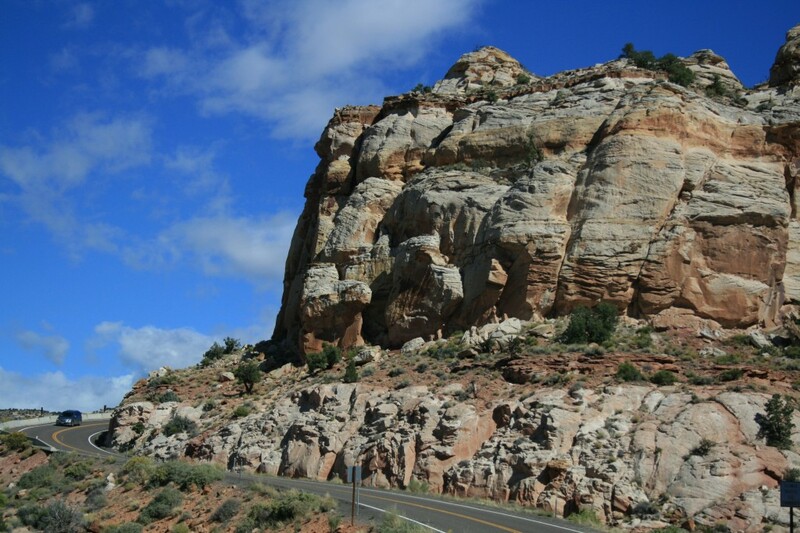 After driving through the Escalante Canyons regions, we drove the steep highway leading up over Boulder Mountain. 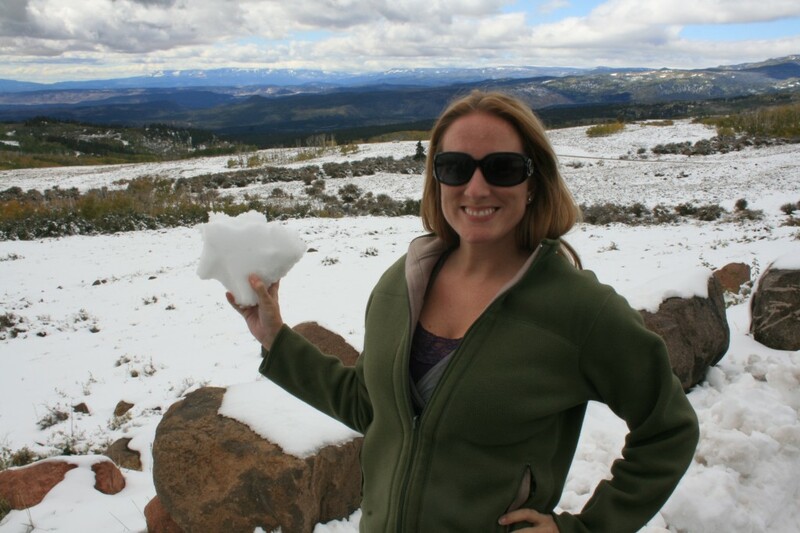 Because we had no idea how much altitude we’d be gaining, we were surprised by how much snow was on the ground! 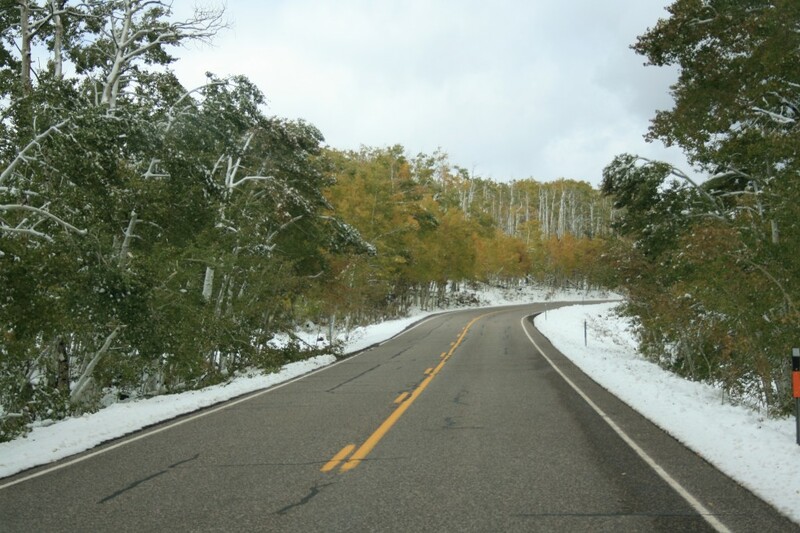 We felt like we were driving through a Winter Wonderland! 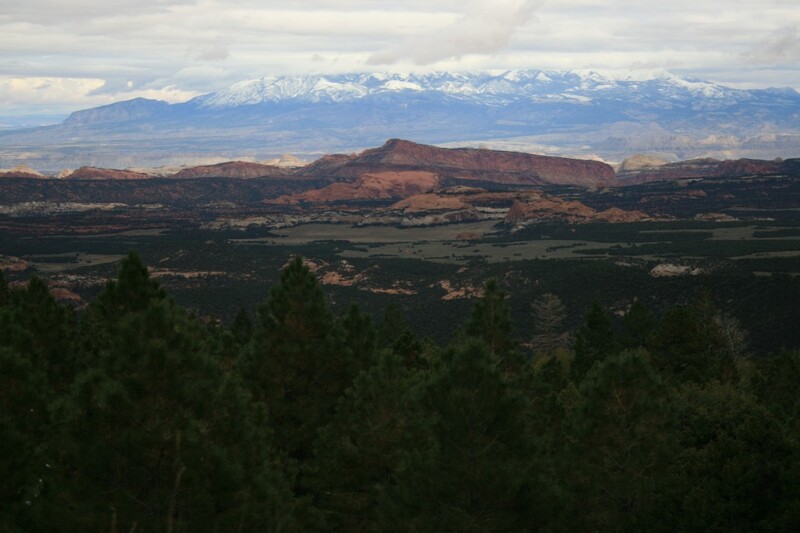 From Boulder Mountain you can see the Waterpocket Fold section of Capitol Reef National Park, our next stop! 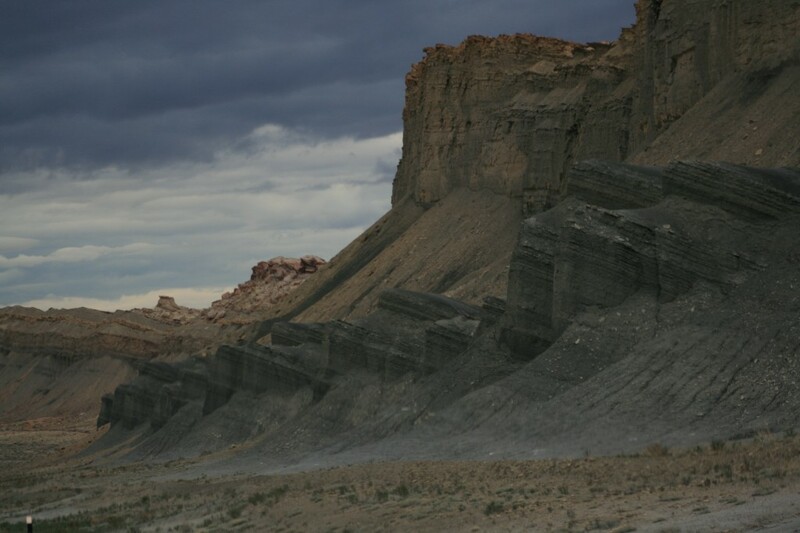 Capitol Reef is most commonly known for the Waterpocket Fold which is a 100 mile long “wrinkle” in the earth’s crust. 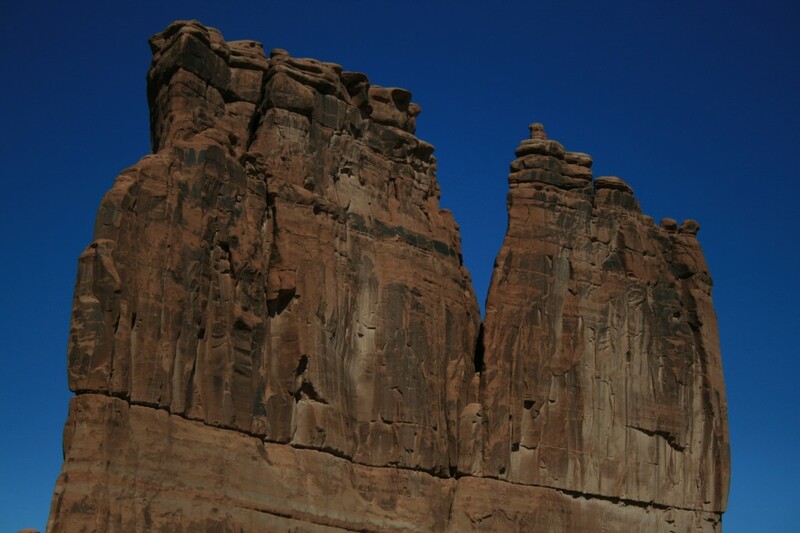 Chimney Rock is one of the many beautiful formations that is a part of the mass array of colorful sandstone cliffs. 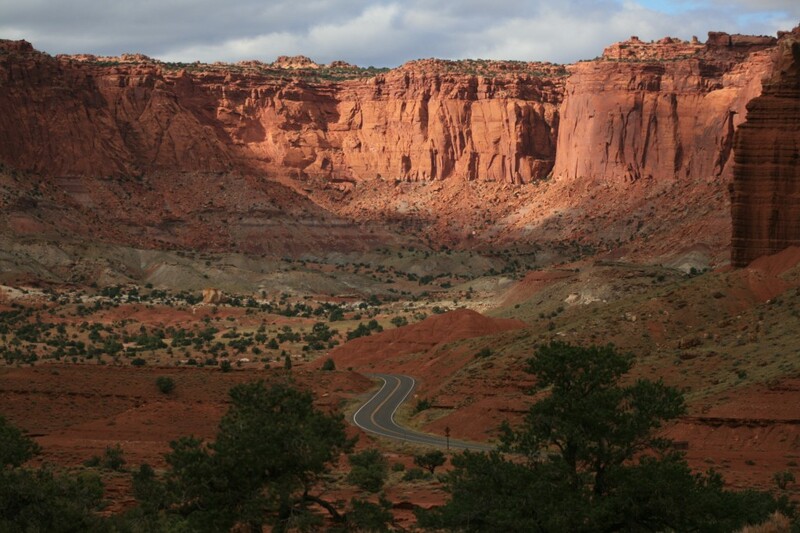 We figured the 25-mile Scenic Drive was the best way to see all that Capitol Reef had to offer. 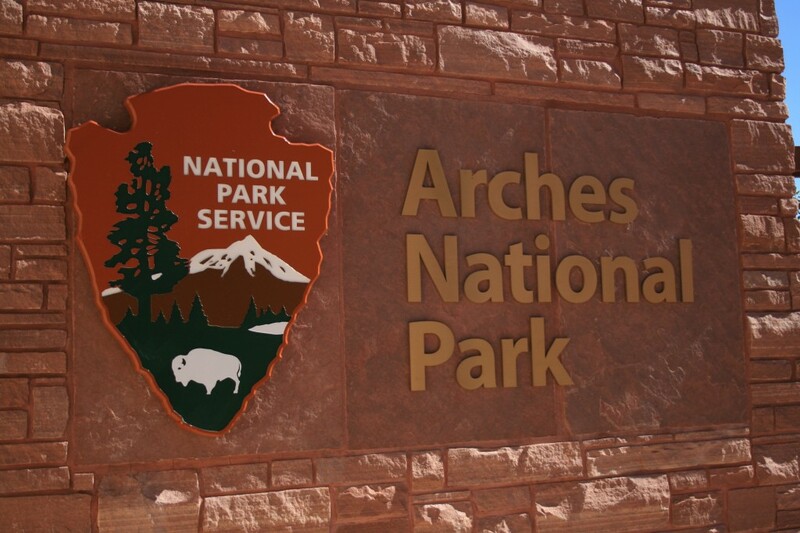 We picked up a map (and a magnet) at the visitor’s center and set off in search of petroglyphs! 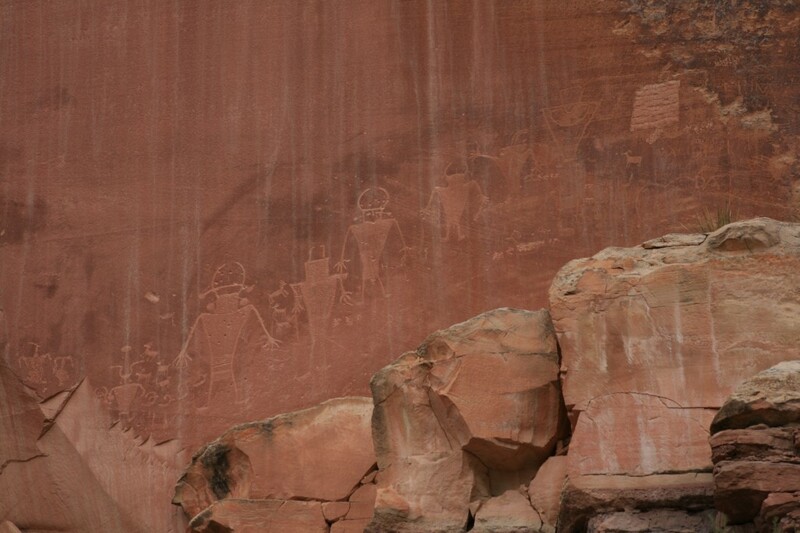 The Fremont Petroglyphs were etched in sandstone by the Fremont people who inhabited the area nearly 1,000 years ago and can be seen from the Hickman Bridge Trail. 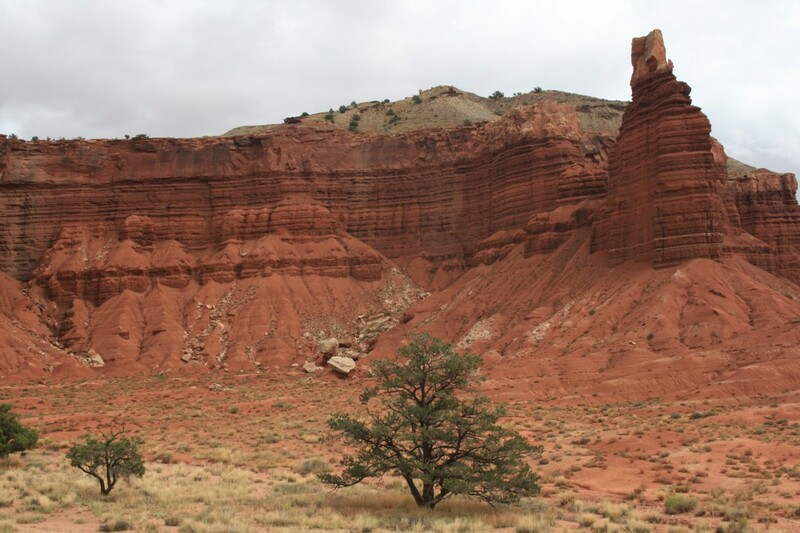 Sam was most impressed with the gray mancos shale badlands on the eastern side of the park. We felt like we were on another planet! 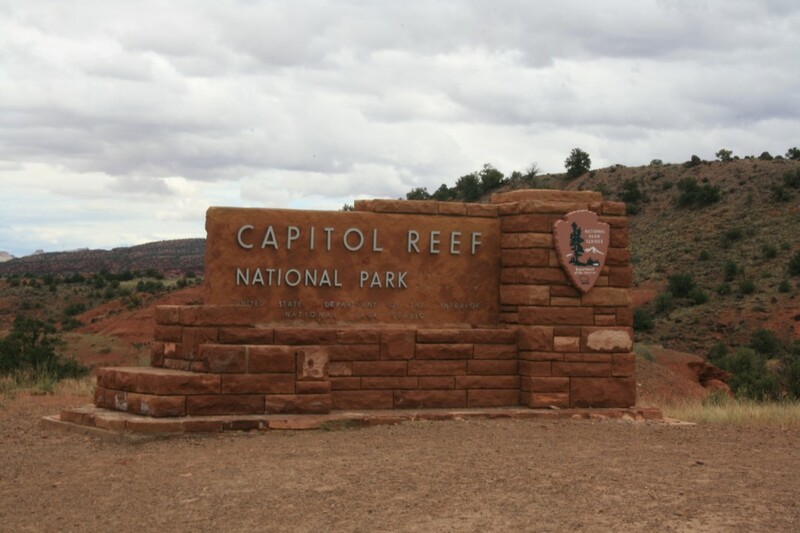 Following our visit to Capitol Reef, we drove 150 miles to Moab, Utah where we stayed at the Arch View RV Resort. 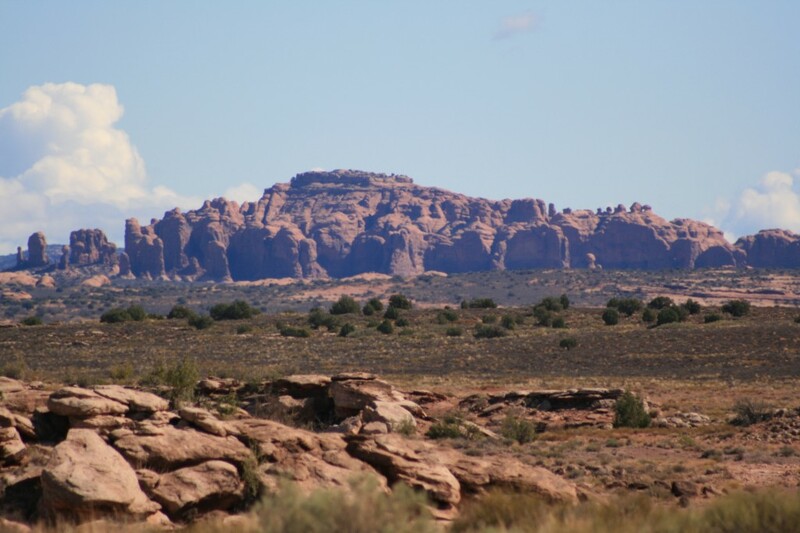 The name did not deceive; we could see Arches National Park in the distance from the RV Resort. We got an early start the next morning by heading to Dead Horse State Park. We were hoping to catch the sunrise, but didn’t get there quite in time! It was still a beautiful site in the early morning sun! 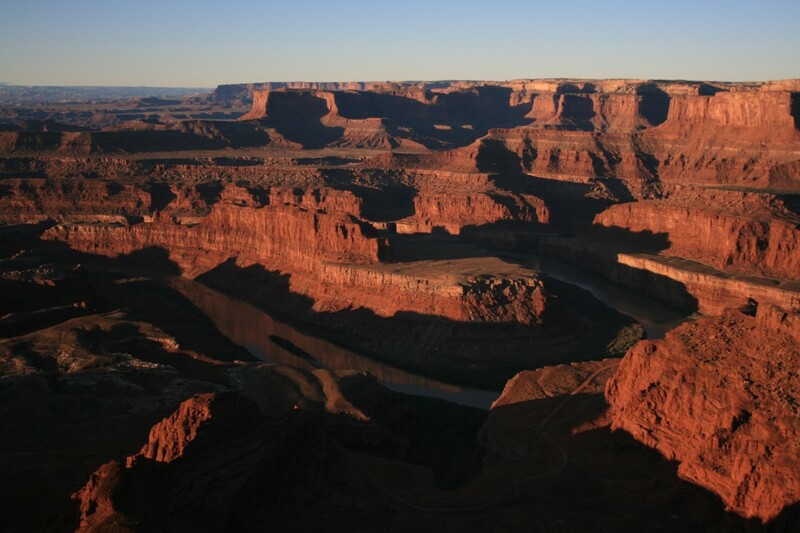 From Dead Horse Point, we returned north on Hwy 313 for 7 miles to the junction the Grand View Point Road and then drove the Grand View Road south into Canyonlands National Park. 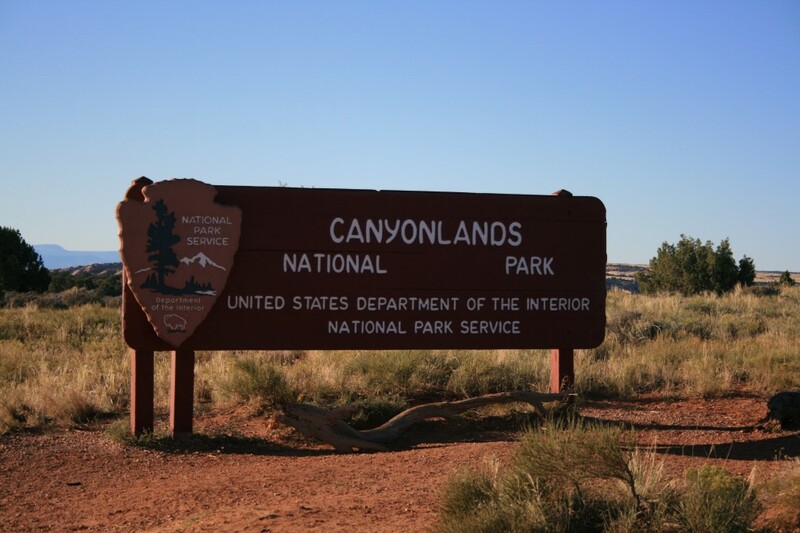 We only visited the Islands in the Sky portion of Canyonlands. This is where the majority of visitors to the park go. 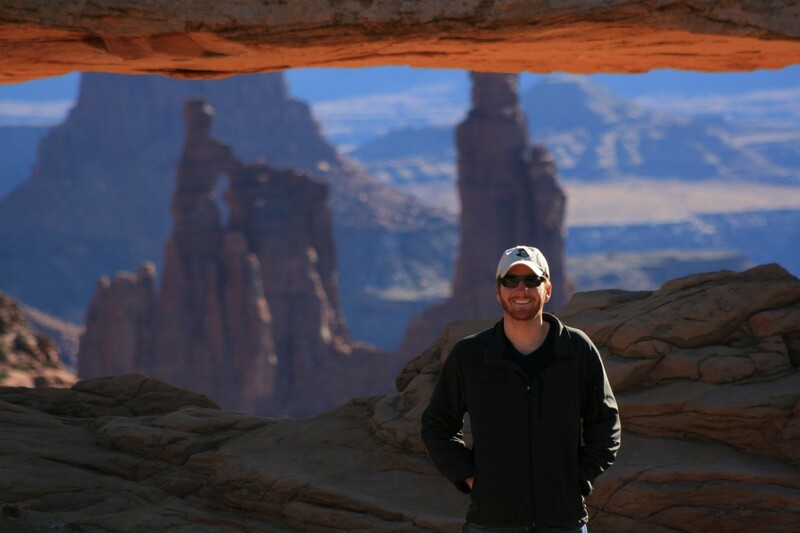 Our first stop in the park was Mesa Arch. 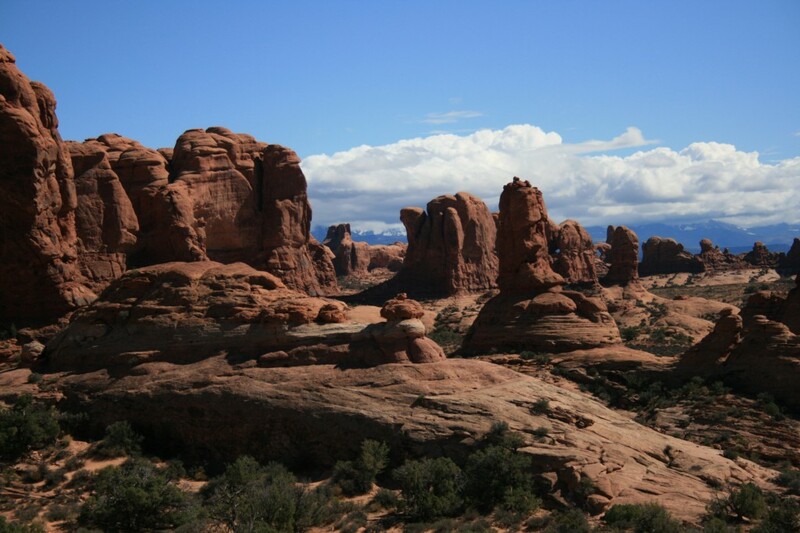 The half-mile loop trail to the arch was a mild walk to an incredible view! We arrived at the arch when the morning sun was hitting it just perfectly! I probably took 50 pictures of the same image, because I couldn’t get over how beautiful it was. 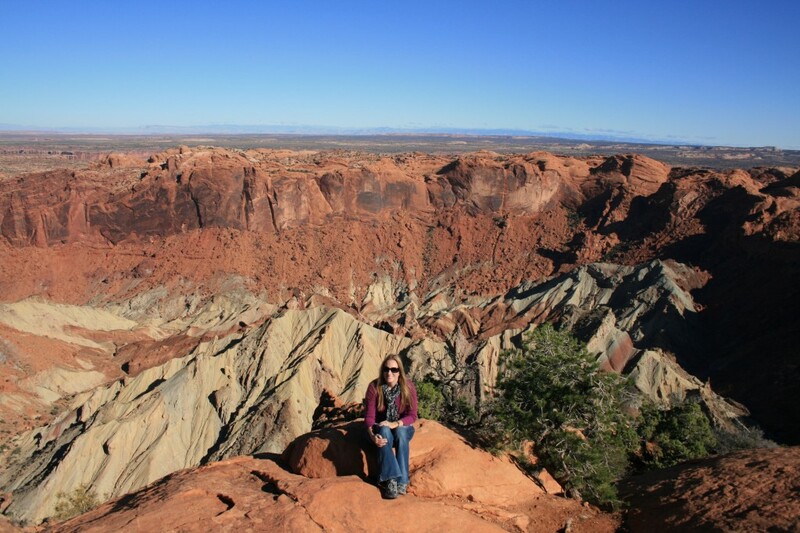 Next we took the Upheaval Dome Overlook Trail. 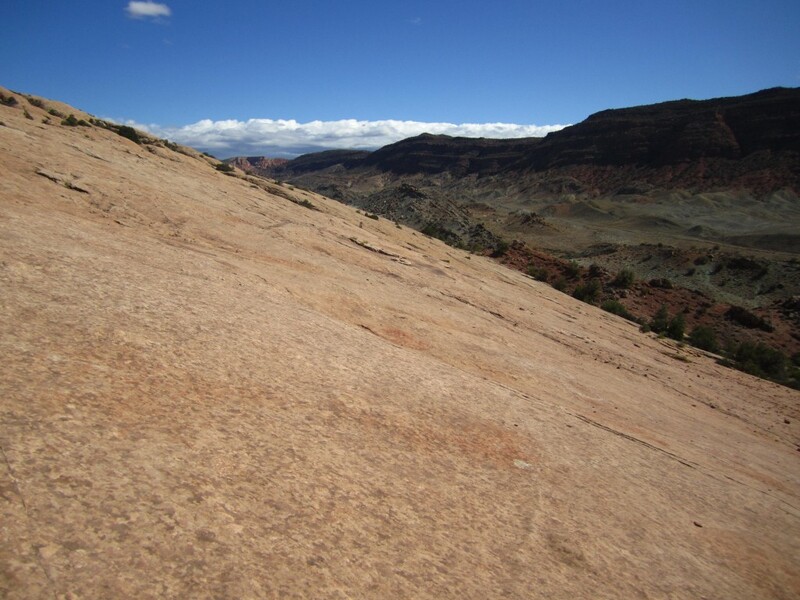 Upheaval Dome measures one mile in diameter and resembles a large volcanic crater with mountain peaks jutting from its core. 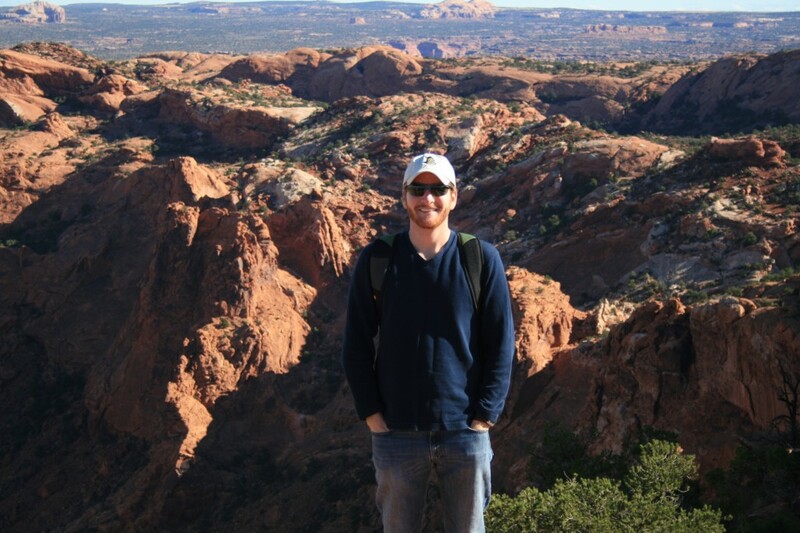 It was a moderately easy, half-mile (each way) hike that lead to outstanding views! 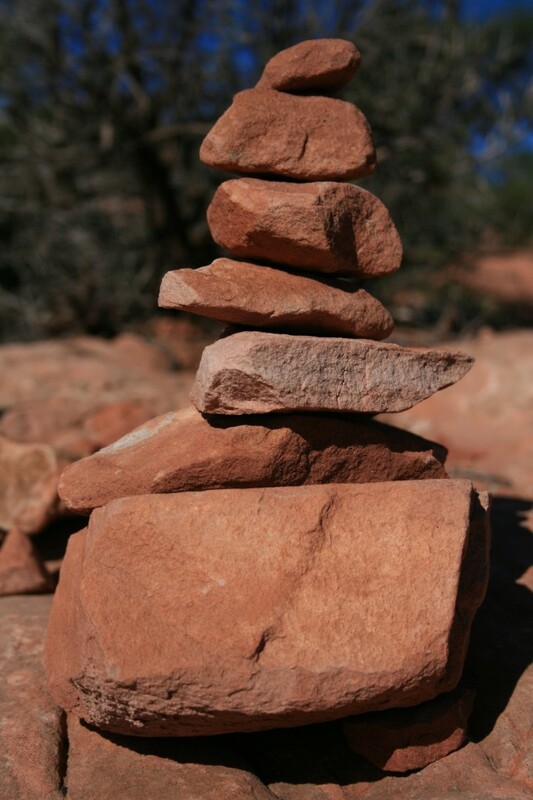 We came across some neat balanced rock statues left behind by previous hikers. 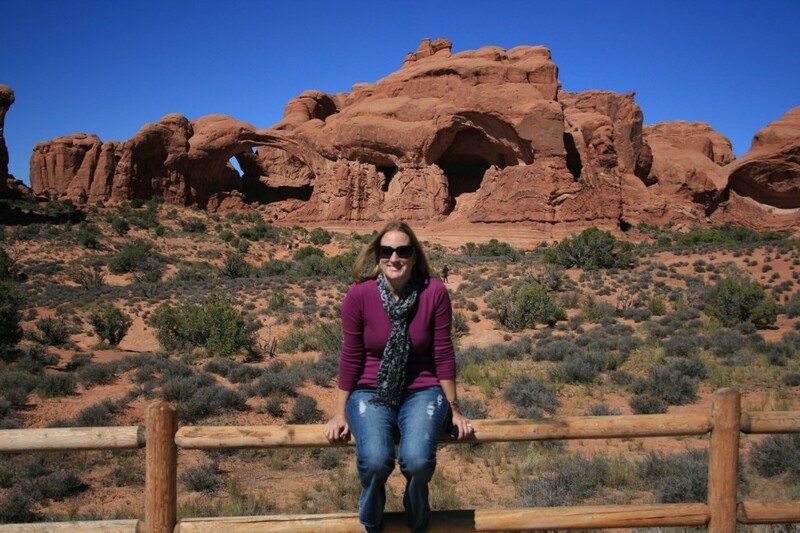 Following our adventures in Canyonlands, we drove less than an hour to Arches National Park. 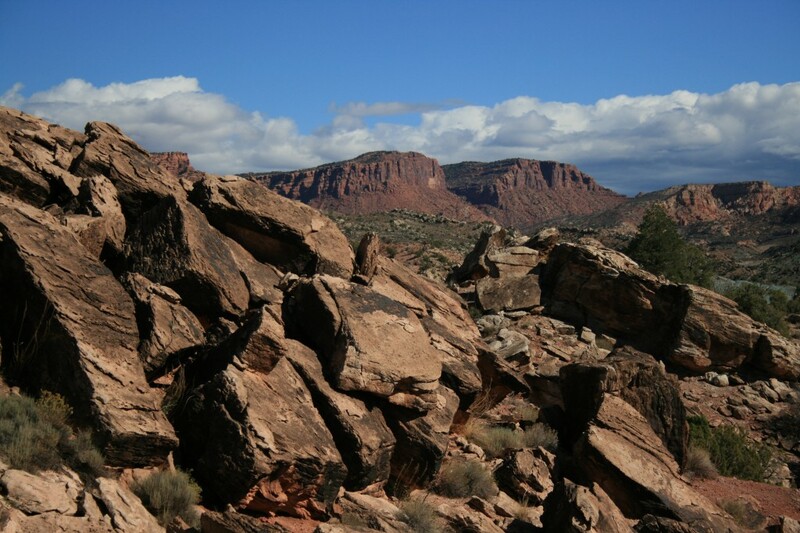 Within the park, there is an 18-mile Scenic Drive taking visitors past many extraordinary rock formations. 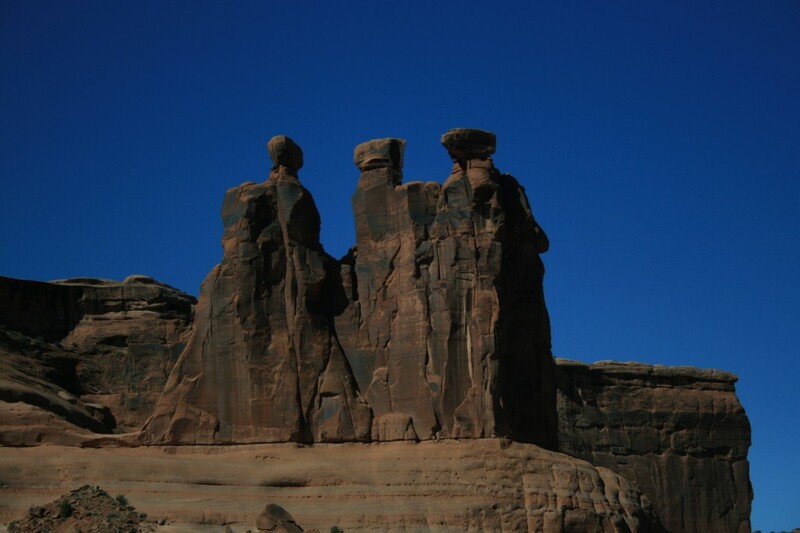 We first came across the Three Gossips. I wonder how long some of these marvels will remain. 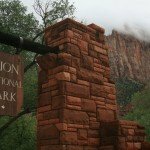 43 arches within the park have collapsed from erosion since 1970. Next we arrived at the Windows section of the park. 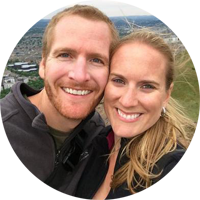 Although the crowds were minimal, it was still somewhat difficult to find parking… especially with a 27-foot RV! 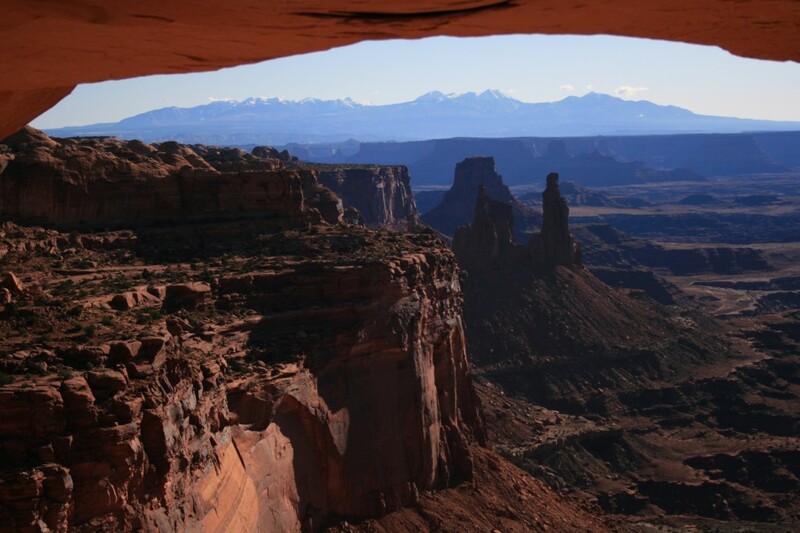 We enjoyed the short hike to North Window Arch. 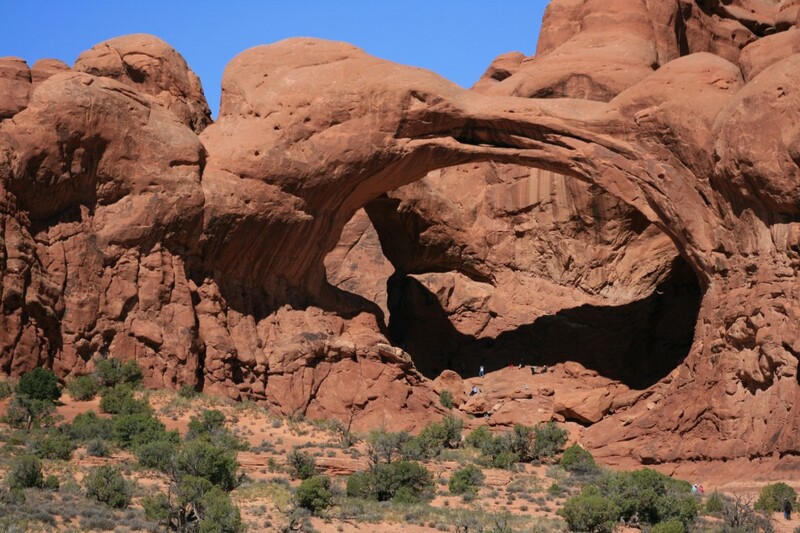 Just a short walk away is Double Arch. The views of the nearby valley were quite impressive! 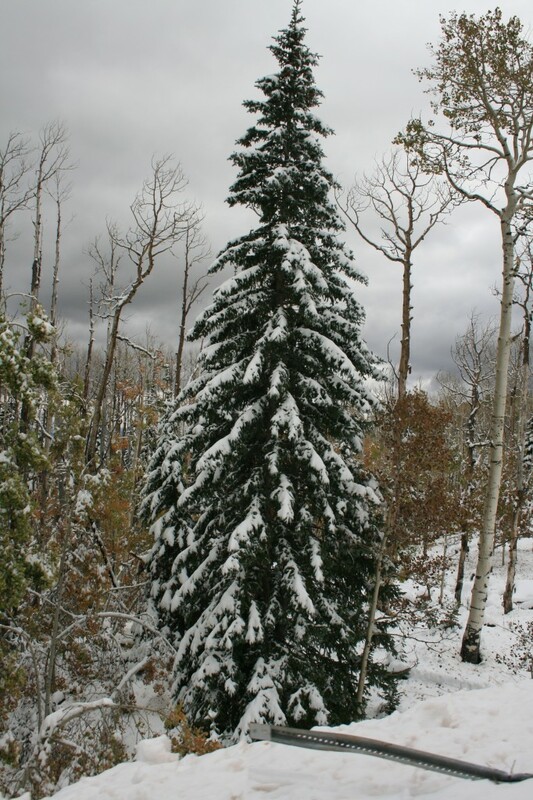 This is certainly different from the landscape I grew up with in Florida! 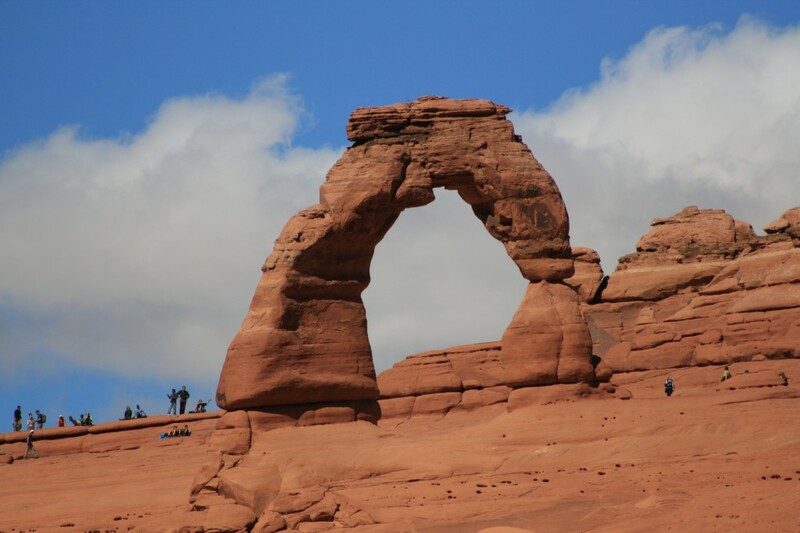 We wanted to see Delicate Arch, one of the most famous natural formations, but again due to our fairly packed itinerary and limited time in each park, we decided to take an alternative hike to see the arch, as opposed to the famous 1.5 mile strenuous trail starting from Wolf Ranch. Delicate Arch Viewpoint Trail, although short, was steep! 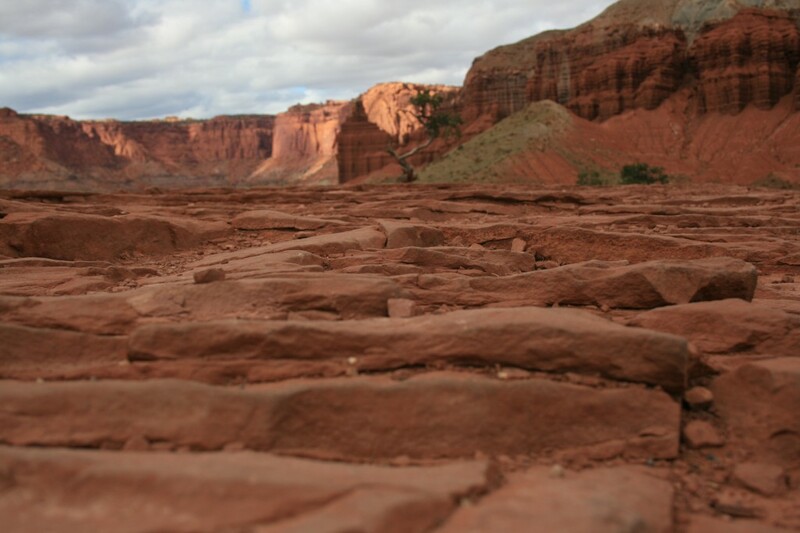 This trail ended at the rim of a steep canyon that separated us from the famous arch. 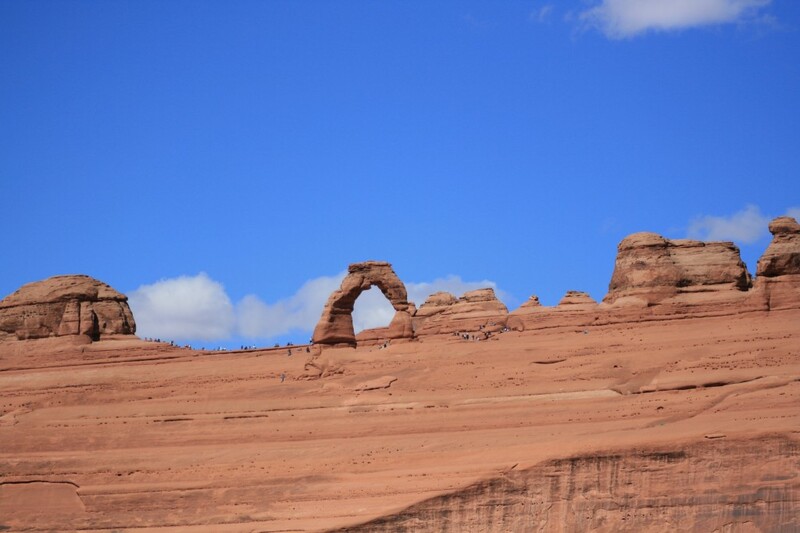 Although we weren’t right up under the arch, we were pleased with the view and would recommend this to others looking for a shorter alternative to the main trail leading to Delicate Arch. 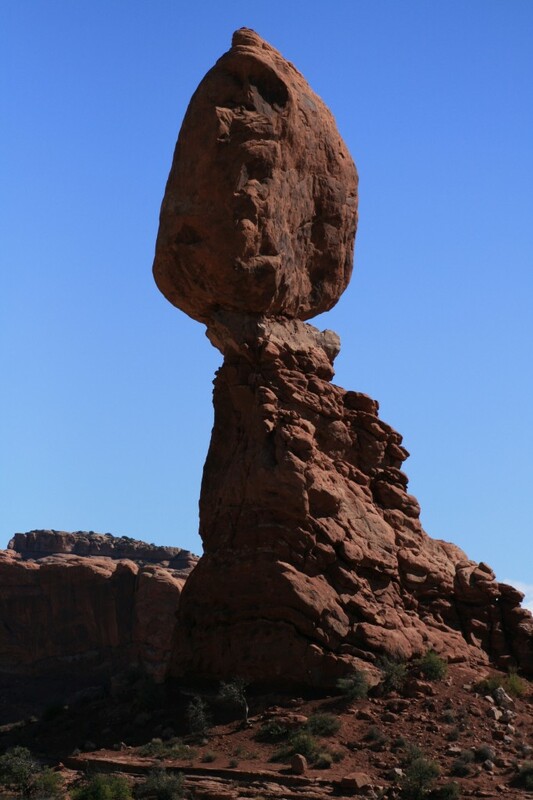 (The first photo of Delicate Arch was taken with a telephoto lens; the arch is not actually this close to where the Arch View trail ends.) 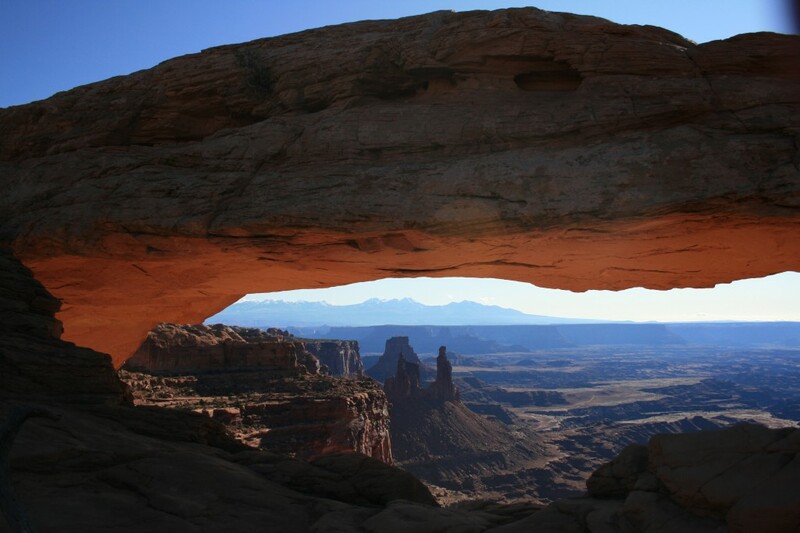 The picture above will give you a better idea of how far the Arch is from the trail end. 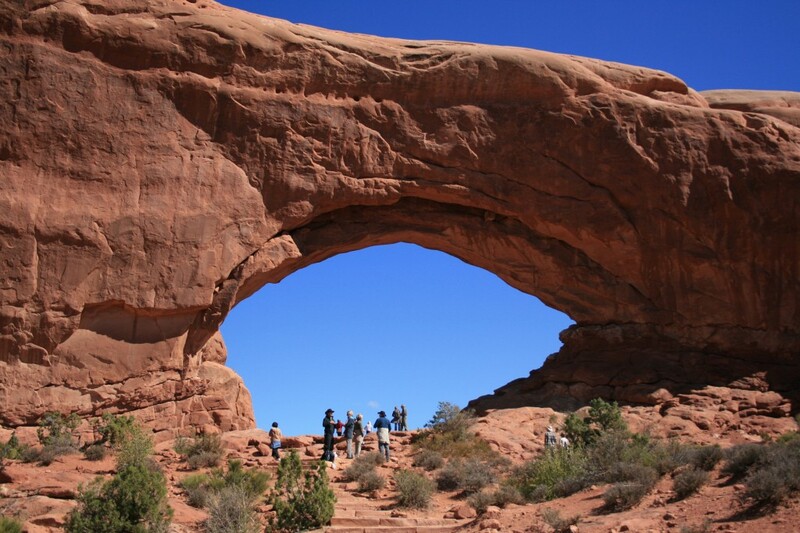 I recommend you bring binoculars or a telephoto zoom lens to get an up-close look at the Arch! This was as far as we went along the scenic route. We headed back in the direction of the park entrance and again enjoyed the majestic scenery. 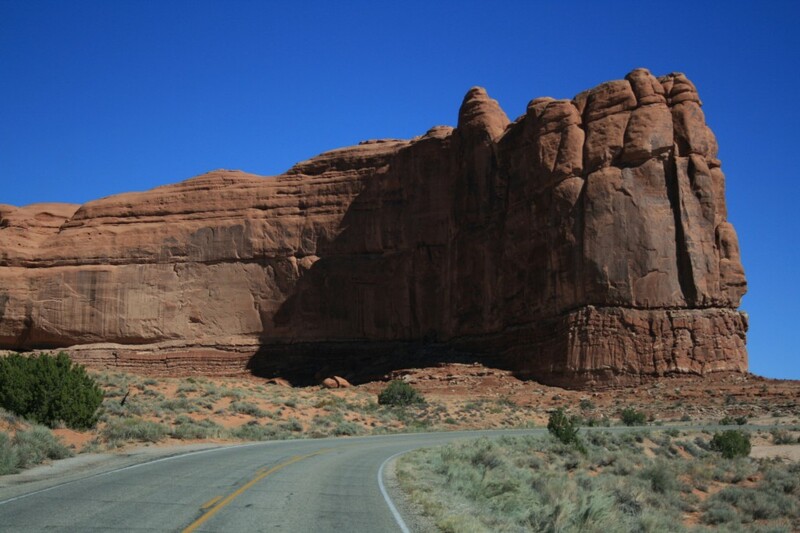 We took Highway 141 for approximately 4 miles until we arrived at Moab Rim Campground. 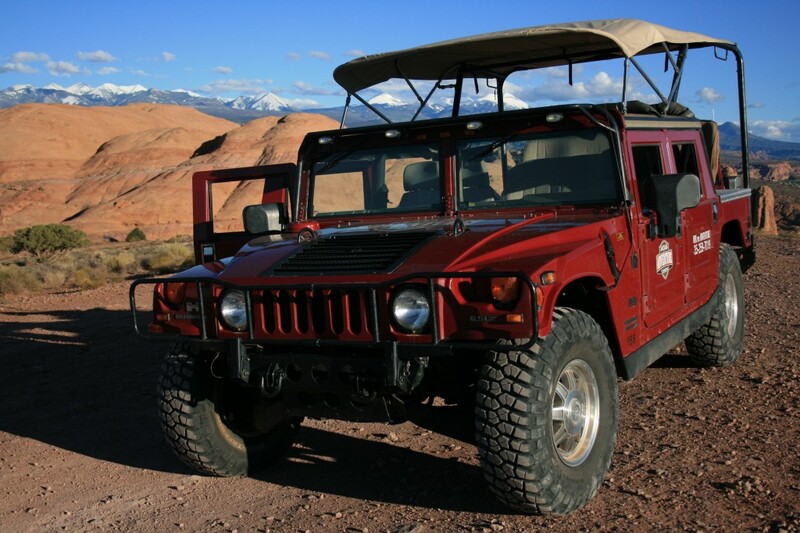 From there, we got settled in, enjoyed a quick snack and waited to be picked up by Moab Adventure Center for the Sunset Hummer Tour we had scheduled. 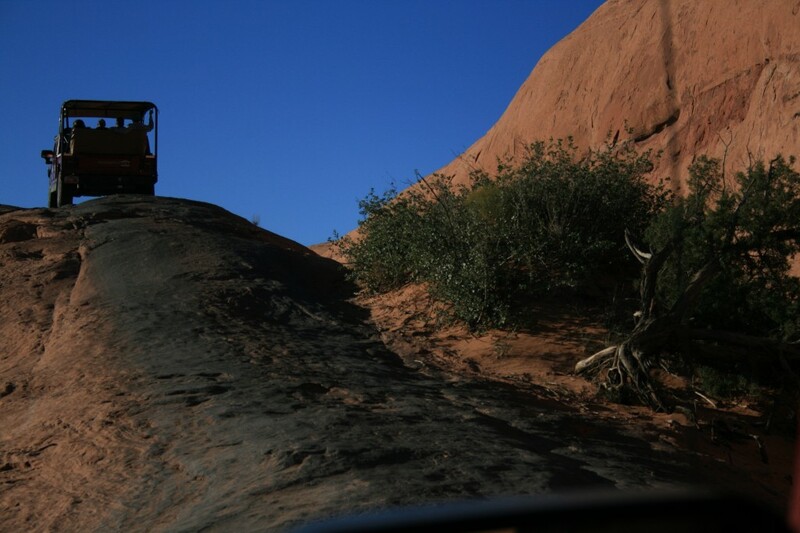 Within minutes of loading into our hummer, we were scaling one of Moab’s famous redrock fins (known as the “Devil’s Backbone”) on our way to an area known as “Hell’s Revenge”. 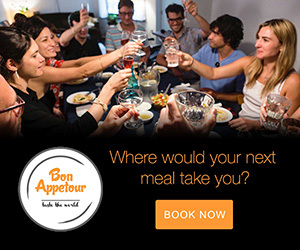 It was quite an adventure! 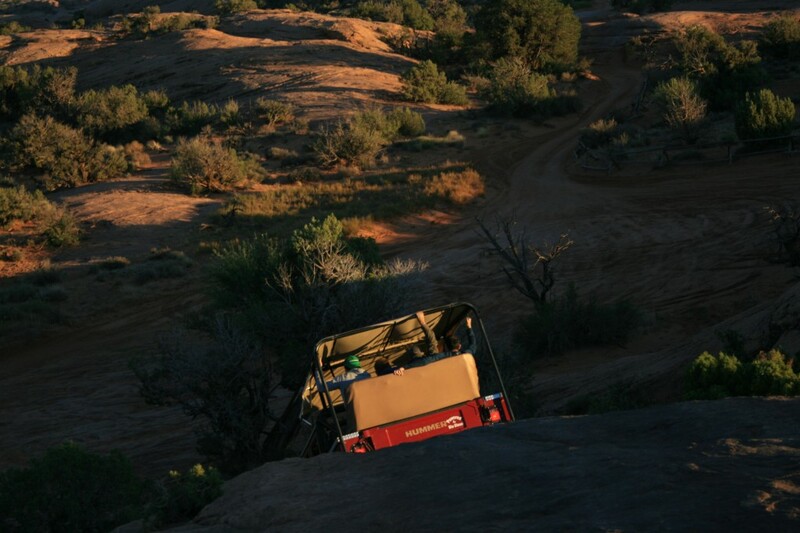 We had no idea, we’d be practically cruising over boulders! 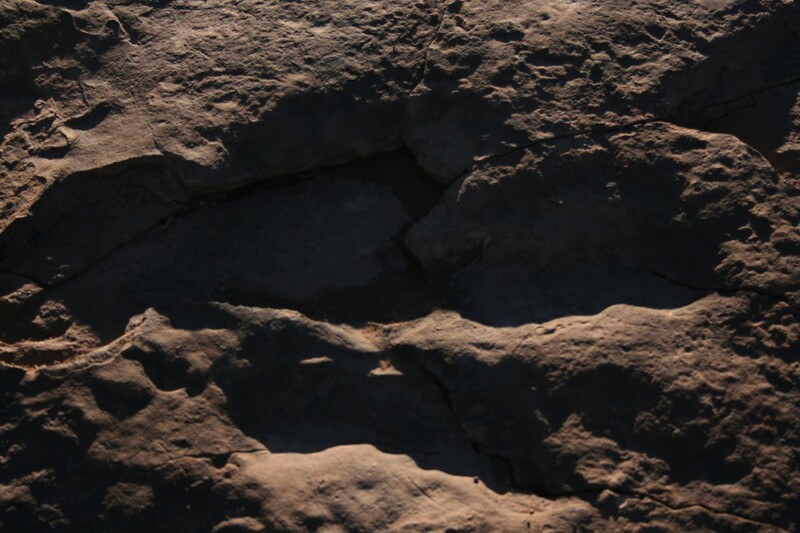 We even came across some dinosaur tracks! 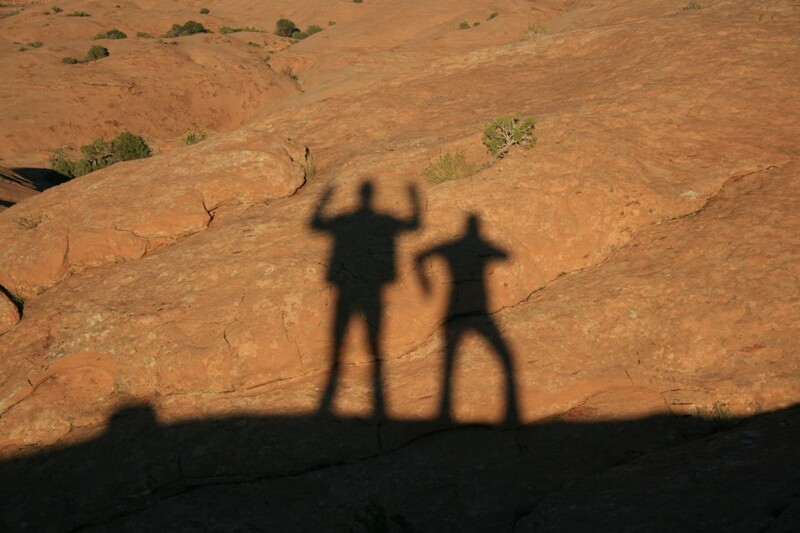 The temperature started to drop as the sun went down, though the light cast on the surrounding mountains from the setting sun was magical… and made for great shadow statues! 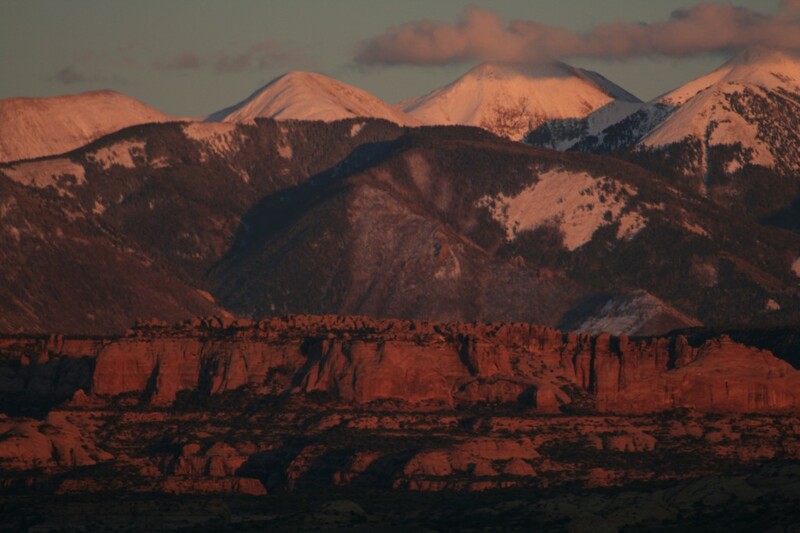 The full moon rose over the snow-capped mountains creating a perfect and romantic backdrop! 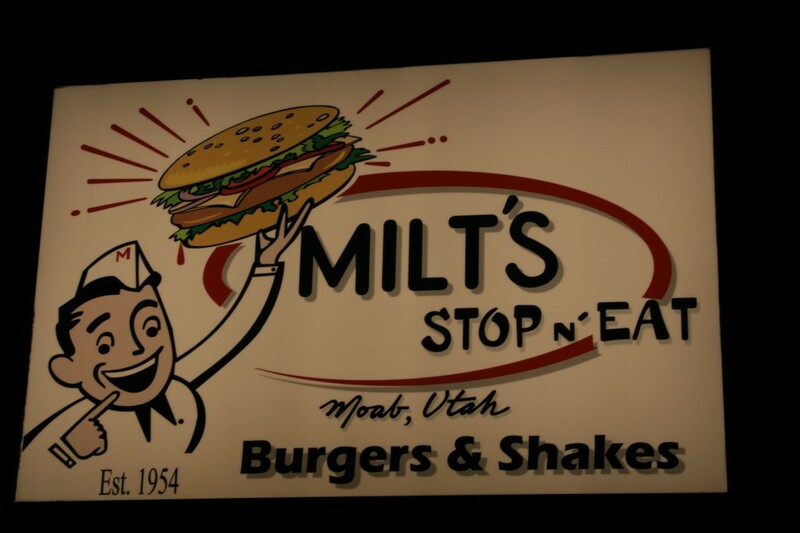 We asked our tour guide for recommendations on restaurants in the area and without hesitation, he recommended Milt’s, an authentic diner that’s been open since the mid-50’s, famous for their burgers and shakes. 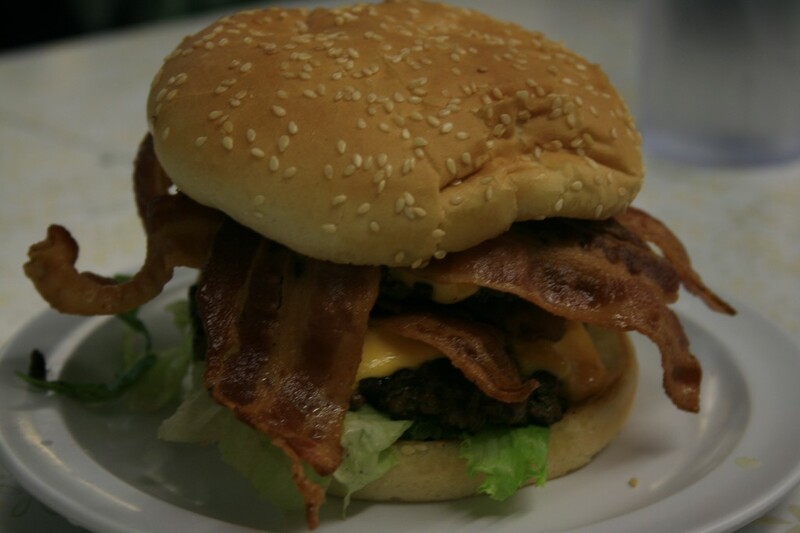 Sam said his flame-grilled burger was one of the best he had ever had! 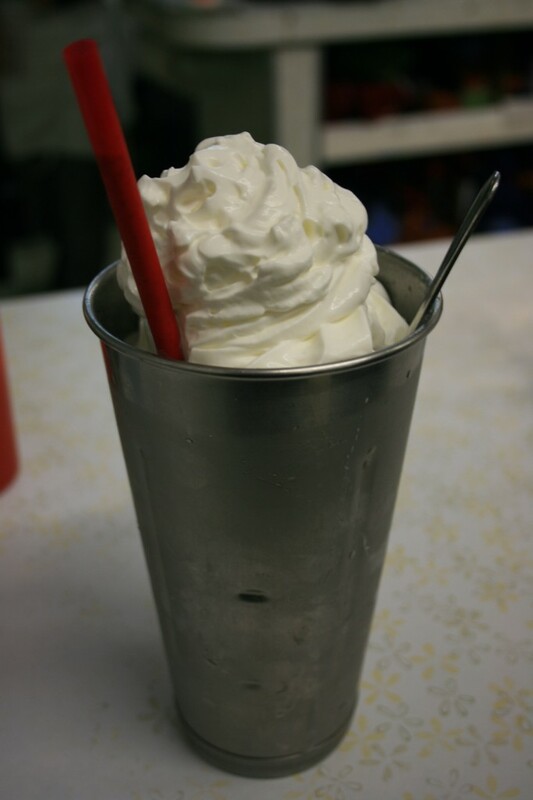 Their milkshakes were amazing… I ordered the Oreo shake. Mmm Mmm! All-in-all, an incredible day! It was time for us to rest up to prepare for the next leg of journey! 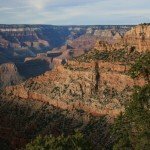 Click here for Part III to see where else we visited on our RV Road Trip Adventure! 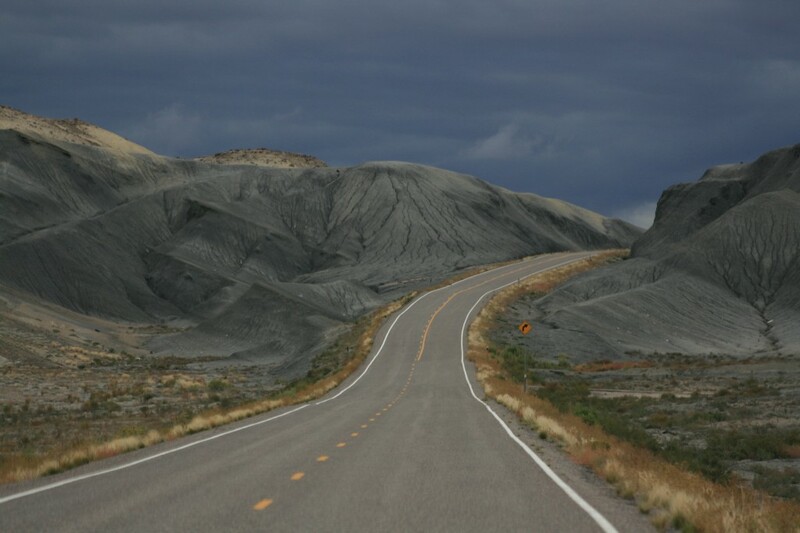 For a short video (6 minutes) of our entire RV Road Trip Adventure, click below. 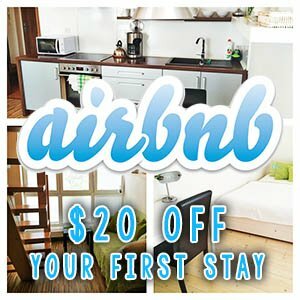 I have been exploring your site and just came across your Utah section. We loved our trip out there and can’t wait to go back. 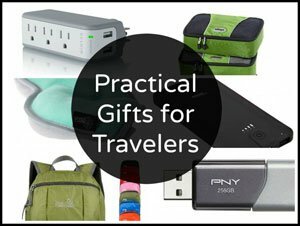 This trip was before we even started blogging, so it’s not one of our better posts, but it still tells the story! 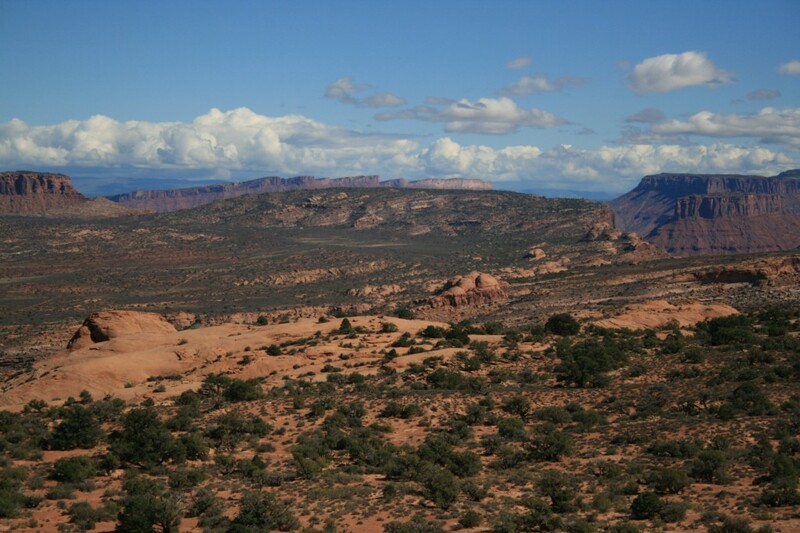 We too cannot wait to get back to Utah; the parks there are simply breathtaking! 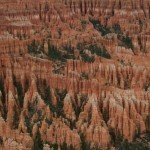 Plus, we have to go back to see Bryce Canyon under clear night skies!